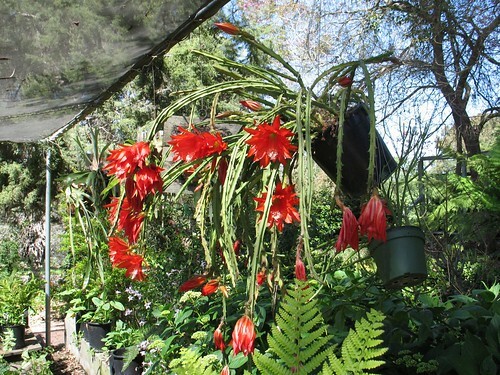 June 2012 Meeting – Ian Thwaites – What is interesting in my greenhouse today. Ian Thwaites came and gave an interesting and eclectic talk on what was looking good in in his greenhouse that morning when he gathered up two trays of plants to show us mixed in with his growing techniques and philosophies. He brought a wide mix of plants that were about a 50/50 split between cacti and other succulents. His growing philosophy is to continually refresh, evolve and refine his collection around what interests him. He recommends you choose the plants you like and buy lots of them and then refine and improve them and how you grow them. He used to use lots of different potting mixes for different types of plants but has now settled on using pure ceramis for most of his plants. He feeds half strength with every watering and varies his fertilisers to get the best coverage of his plants’ needs. He hand waters his collection and it takes an entire day. During the winter they get nothing except for small plants which get a little drink. He starts watering in the spring when the daffodils bloom. He buries the tubers on his caudiciforms to get better top growth. His current preferences are for dense clustering plants – Sulcorebutia rauschii and Euphorbia sepulta – examples of convergent evolution. Also in fashion are Sanseveria and Madagascan Euphorbias. Mark presented the plant of the month: Disocactus speciosus which he grows hanging from trees in his backyard (with pigeon protection otherwise they vanish).